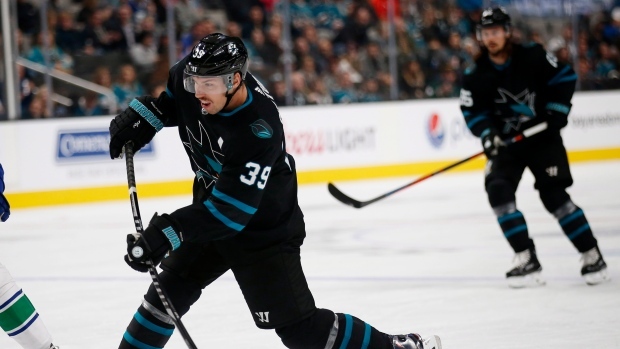 TORONTO — Logan Couture doesn't like how his team has played on its current road trip. And he's tired of waiting for the Sharks to turn things around. Couture and his San Jose teammates fell 5-3 to the Toronto Maple Leafs on Wednesday night, handing the Sharks their third straight loss and second in as many nights. And while some of Couture's teammates are preaching patience over a tough stretch that's seen them lose five of their last seven games — with two of those losses coming against the Maple Leafs — Couture dismissed the notion that the team is on the cusp of piecing it all together. "My personal opinion, I don't think we're close," Couture said. "We show spurts and signs that we're capable (of playing with the best in the league) but we haven't put together an effort against a top-quality team. ... We gotta figure it out soon." "I'm a believer that it takes time. (But) I'm a believer that it doesn't take 26 games," he added curtly. "So we need to figure it out." Captain Joe Pavelski, who had one of San Jose's goals Wednesday night, was less critical in his assessment of the team after the game. "It always feels close, it really does," Pavelski said. "It's been a tough start to the trip in a lot of ways. But it still feels there and I think we understand, 25-game mark you have a pretty good feel for your team. ... We got some good pieces here and a lot of new faces, so we'll keep working and keep building towards figuring it out a little bit better." The Sharks, who are still among the leaders in the Pacific Division with 29 points, are in the midst of a difficult five-game road stretch that began Saturday in Vegas (a 6-0 loss). They then fell 3-2 to the Sabres in Buffalo on Tuesday night and have two days off before their second set of back-to-backs in Ottawa (Saturday) and Montreal (Sunday). Saturday's game against the Senators will mark Erik Karlsson's anticipated return to Ottawa since the star defenceman was traded to San Jose in the off-season. The Sharks are just hoping for a win to help salvage the trip. "We've got a chance to focus on the next game in Ottawa and put this one behind us," said forward Kevin Labanc. San Jose came into the game with the league's best penalty kill at 89.3 per cent (67-of-75) but allowed three power-play goals in Wednesday's loss — including one to superstar Auston Matthews in his return from a shoulder injury. Head coach Peter DoBoer called the Leafs' success on the power play "the story of the game." "They went 3 for 4. You're not going to win on the road giving up two power-play goals nevermind three," DoBoer said. "Our attention to detail on the PK is as good as anybody in the league. "It wasn't tonight and you've got to give them credit." Couture had a different take on Toronto's win. "We're giving up too many easy goals, too many empty nets, breakaways, odd-man rushes, same old story," he said.